Order Christmas Gifts in July and Save! Our Holiday Sleigh, which sells out early year after year. Save 10% by placing your holiday orders now. Note: This deal is still going on, but not for long! During the Holiday season things tend to speed up and get very busy for all of us. At FanciFull, this is especially true. We get much of our business during the Christmas season, and every year we end up selling out some of our most popular items. While we love to do lots of business, it always dissapoints us to have to tell a customer that we're "Out of stock." Thats why we came up with the idea of Christmas in July. Last year we had a very lovely red bowl that we knew would be an excellent container for a Christmas gift. The basket was so popular that we sold over half our stock of it by October! It continued to sell well. Towards the end of October we got an order for 150 of them, but only had 75 left. We called the company that we purchased the bowls from to order more, but because of the demand and availability we weren't able to get more of them until after the new year. This is just one example of why its a great idea to order your gifts early. With Christmas in July, we are offering you a chance to order your presents early so we can guarantee that the gifts you want to send are available in December. 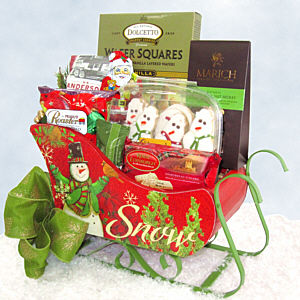 This is also the best time to order custom gift baskets. Our head designer is more easily available and we have time to get special items made for you. And, of course, if you order your Christmas and New Years gifts early you'll save 10%! This is a great way to order, especially if you are planning on ordering a lot of gifts. So order your Christmas gifts NOW. You'll get exactly what you want, and save yourself time and money in the process! Call now and save 10%. Baskets are flying off our shelves already and this offer only lasts through July!